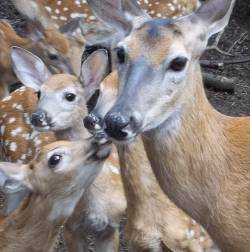 Only orphaned, injured, and sick fawns should be assisted. Document the fawn’s location (close intersections, town and county, or GPS coordinates) Call the wildlife rehabilitator in your area for advice and assistance right away. Calling the wildlife rehabilitator before intervening, will not only alert them to your emergency, but will also enable them to inform you about local laws and regulations. Not all states allow the rehabilitation of deer of any age, including fawns. Even states that allow rehab may not have a rehabilitator locally or may not allow deer to be rehabbed from certain areas. Deer should not move around the state. The potential of moving a disease to other areas is too great to allow deer to be transported from distant areas. If the rehab center can receive it, transport it right away. Even a few days can disrupt a fawn’s personality. Don’t feed it anything. It will get what it needs when it arrives, usually beginning with injectable fluids. So how do rehabilitators keep human raised deer wild? With minimal handling and by keeping large numbers of fawns together. In Red Creek’s case, we have an adult doe, “MamaDeer” who fosters them.